When it comes to e-commerce, the small details matter. Whether it’s the product description, the images or the placement of the “buy” button, there are seemingly endless ways to optimize your customer experience, improve your SEO and increase conversions. At Connexity, we’ve spent decades helping retailers improve online sales. Here are our top 10 tips to start boosting revenue immediately. Surface product ratings on category pages. Countless studies show that customers are more likely to buy products with reviews – and yet for most online stores the ratings are confined to the product page. Considering that a lot of product page traffic enters through the category page, you can increase clicks through to products if you surface those ratings on the category page as well. Offer a “smart search” that suggests common categories and items. Search is the most common way shoppers find items in online stores. Make sure your search bar not only performs extremely well, but it provides suggested searches when shoppers start typing in a new query. Smart search allows people to easily scan available inventory that relates to their desired keyword, without having to load multiple “search result” pages and scroll through a different list of options each time. Leverage breadcrumbs for a better customer experience. For e-commerce sites, particularly large sites with a lot of product pages or a complicated taxonomy, breadcrumbs can be an excellent way to help the user orient themselves on your site. A few words to the wise: breadcrumbs should never replace your main navigation, and they should be used consistently throughout your site. Remember the “F-shape” reading pattern. People scan webpages the same way that they read a book: top left to right, then back to the left again. This “F-shaped” reading pattern persists on product pages, so don’t try to reinvent the wheel. Put your images – your most eye-catching asset – on the top left, and place your product description and “buy” button on the right. Additional copy can be provided below or in tabs. Go big with your product description for better SEO and conversions. Shopping online is stressful because customers can’t touch an item or evaluate its quality in-person. You need to fill in the gaps for things like weight, size, material, machine washable status and compatibility with other products. Beyond product specifications, don’t be afraid to be playful or appeal to people’s emotions. Tell a story and help the shopper imagine themselves using this item (here’s a great example of this). This approach is especially effective with handmade, high-quality goods or apparel. And please, please, do not copy your product description from manufacturers – doing this not only hurts your SEO due to duplicate content issues, it usually leads to stale copy that lacks keyword richness and doesn’t convert. When it comes to product images there are oh-so-many best practices you can (and should) follow. Firstly, make sure you have large, high-quality photos. Offer multiple images, which showcase the product from various angles and in different contexts. Another big opportunity most retailers miss is the chance to upsell other products within their photos. Maybe the sweater model is also wearing a scarf and hat that match well, or maybe the camera is mounted on a snazzy adjustable tripod. Providing shoppers with information about complementary products pictured is not only helpful, it plants the seed to create interest in additional items they can throw in the cart as well. Remove any left-hand navigation from product pages. 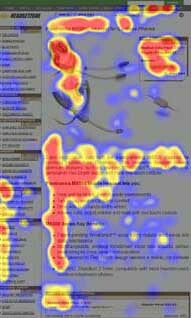 If you think back to the “F-shape” reading pattern mentioned in #4, it’s clear that users tend to concentrate their attention on the left-hand side of a webpage. For product pages, this is where the product title and photo should be positioned in order to grab the bulk of the shopper’s attention – if you have a vertical navigation there instead, it distracts shoppers’ attention from the item. Keep your store navigation on the top of the page, and use breadcrumbs or drop-downs to help users navigate. Anticipate and answer common concerns close to the “buy” button. The “Add to Cart” button must be above the fold. I know, it seems obvious – but countless online stores miss this cardinal rule, and not all Shopify or e-Commerce templates default to this. It’s essential that your “Add to Cart” button is featured prominently above the fold, ideally with a bright color that demands attention. Leverage trust wording before shoppers enter checkout. It seems minuscule, but when it comes to making shoppers feel secure, even a single word can sway a buyer’s decision to buy. Especially in light of the latest hacks, consider altering your phrasing to emphasize your data protection (for example “Enter Secure Checkout” instead of simply “Enter Checkout”).